What is GSTR 9 annual return? Who should file GSTR 9 annual return? What is the due date of GSTR 9? What is the penalty for the late filing of GSTR 9 form? 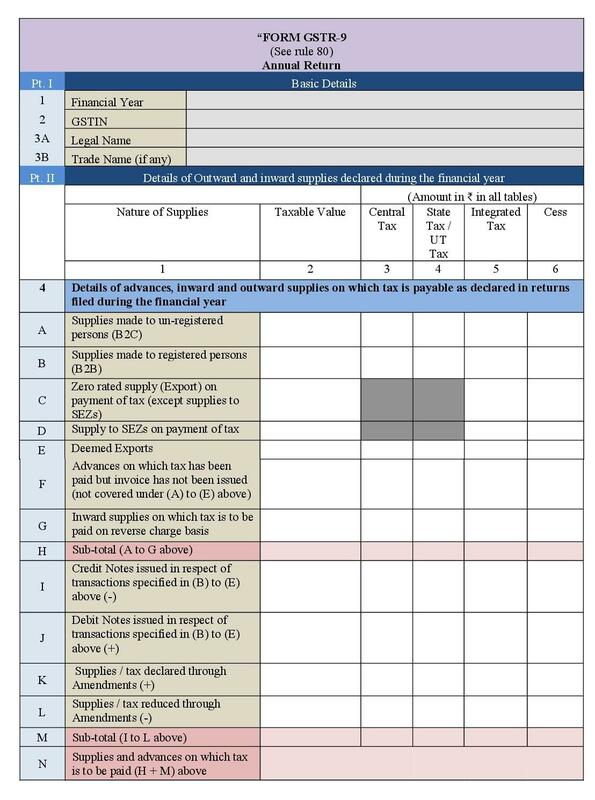 What are the details required in the GSTR 9 form? 1. What is GSTR-9 annual return? GSTR 9 form is an annual return to be filed once in a year by the registered taxpayers under GST. It consists of details regarding the supplies made and received during the year under different tax heads i.e. CGST, SGST and IGST. It consolidates the information furnished in the monthly or quarterly returns during the year. Persons paying TDS under section 51 of GST Act. 3. What are different types of annual returns? GSTR 9: GSTR 9 should be filed by the regular taxpayers filing GSTR 1, and GSTR 3B. GSTR 9C: GSTR 9C should be filed by the taxpayers whose annual turnover exceeds Rs 2 crores during the financial year. All such taxpayers are also required to get their accounts audited and file a copy of audited annual accounts and reconciliation statement of tax already paid and tax payable as per audited accounts along with GSTR 9C. GSTR-9 due date is on or before 31st December of the subsequent financial year. For instance, for FY 2017-18, the due date for filing GSTR 9 is 31st December 2018*. Late fees for not filing the GSTR 9 within the due date is Rs. 100 per day per act up to a maximum of an amount calculated at a quarter percent of the taxpayer turnover in the state or union territory. Thus it is Rs 100 under CGST & 100 under SGST, the total penalty is Rs 200 per day of default. There is no late fee on IGST. 6. What are the details required in the GSTR-9 form? -Segregation of inward supplies received from different categories of taxpayers like Composition dealers, deemed supply and goods supplied on approval basis. The declaration of the information in the Annual returns has multiple implications. Any incorrect information can attract tax demands, interest and penalties on the same, leave alone the long-term litigations that follow years later. The principal source for preparing GSTR-9 will be GSTR-1 and GSTR-3B returns. All information must be cross-checked with the books of accounts before declaring in the annual returns. Broadly, the form entails the declaration of annual sales, bifurcating it between the cases subject to tax and cases not subject to tax. On the purchase side, the annual value of inward supplies and ITC availed thereon, classified as inputs, input services and capital goods and the ITC to be reversed due to ineligibility. While at it, GSTR-9 is divided into six parts. Here is a comprehensive list of what needs to be declared and from where one can fetch the information. Primarily, certain transactions are not reported in the GST returns, but these affect the tax liability at the end of the annual period. Supply without consideration and goods sent on approval basis to name a few. One of the popular ones being the deemed supplies where taxpayers have sent inputs or capital goods to the job workers and have not received them by one or three years respectively. It is clarified that ITC cannot be claimed in GSTR-9- Annual return. Further, liability identified later can be deposited with Government using DRC-03 Form. The form was further simplified on 31st Dec 2018. Formats of GSTR 9 released early September 2018 had a lot of ambiguities. The issues were mostly based on the fact that the annual return form would not auto-populate the information which was already filed in the periodic returns. In order to make the filing of annual return simple for taxpayers, the GSTN updated the form and resolved most of the issues. These are some of the issues still persisting in the annual return form. 1. 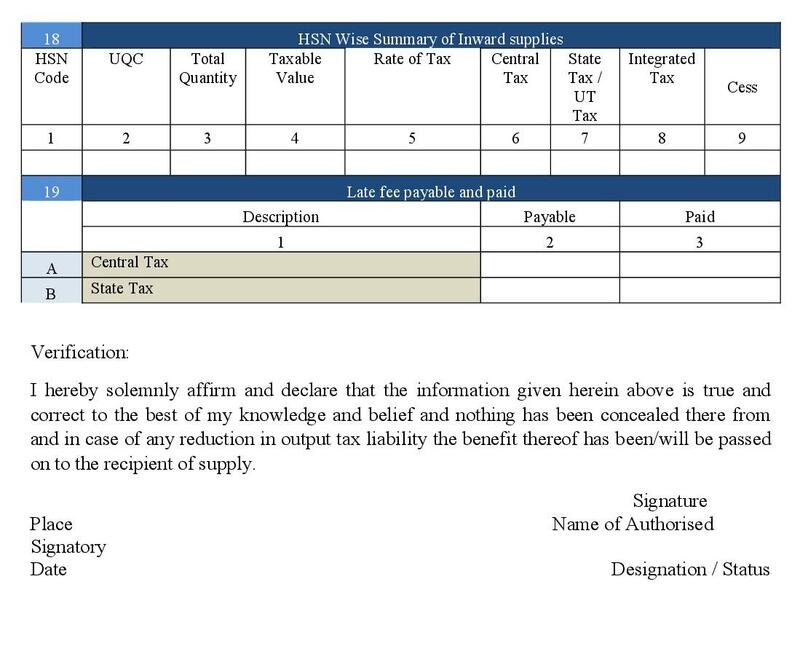 HSN of inward supplies is required in the annual return GSTR 9 which was not needed while filing monthly GSTR 3B. However, reporting of HSN summary is restricted only to those HSN which accounts for atleast 10% of the total summary of inward supplies. This requirement of reporting HSN wise inward supplies is cumbersome, if not maintained earlier. 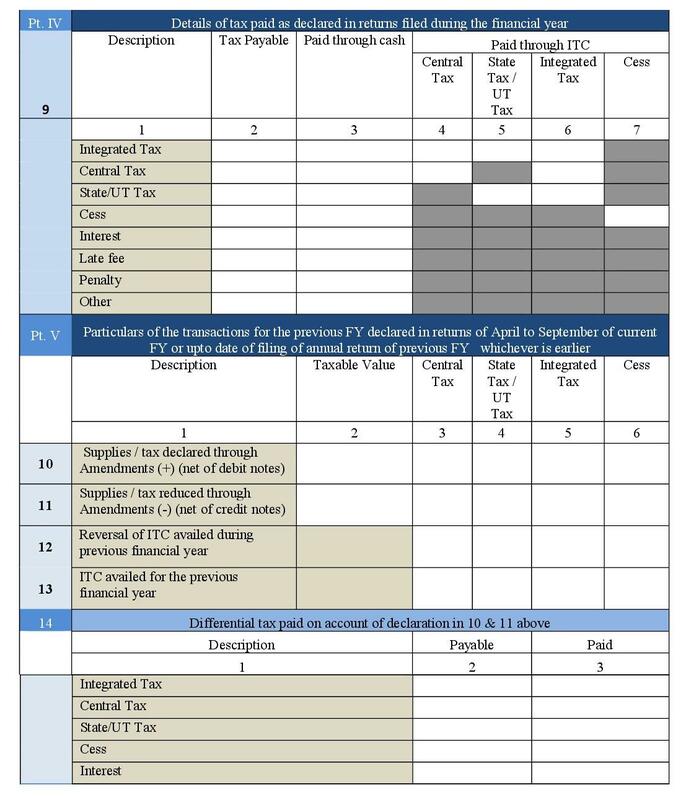 However, ClearTax GST will fill in table 18 i.e. HSN codes of the inward supplies in the GSTR 9 automatically from the purchase register. 2. The difference in the annual return as per the books of accounts and GST data filed during the financial year. The government gives an option to either declare values as per the books or as per returns already filed. GSTR 9 should provide the means to verify whether the figures from GST data filed for annual return are in line with the books of accounts. ClearTax GST will prepare annual returns in 2 formats; one as per books of accounts and other as per GST data filed. In case of any differences, a reconciliation report will be generated and accordingly, the discrepancies will be sorted. 3. 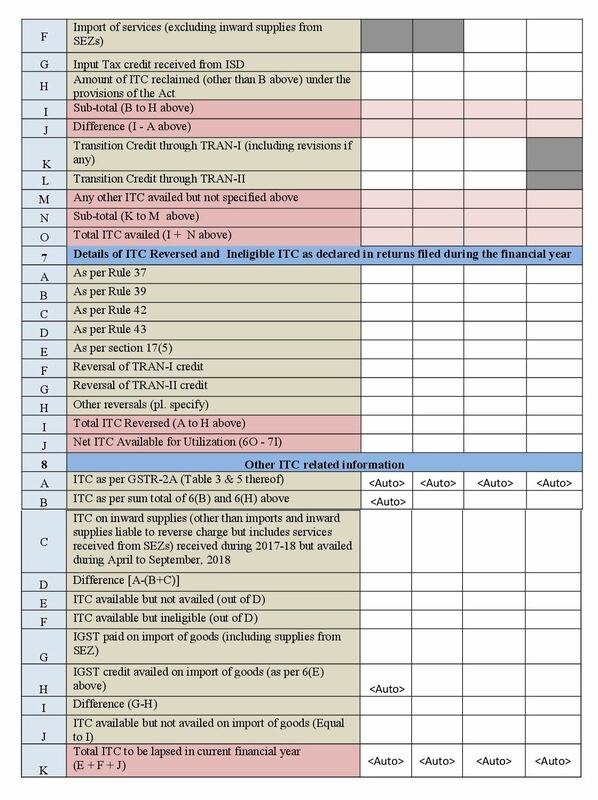 Segregated details of ITC availed are required as Inputs/Input services/ Capital Goods This bifurcation in the ITC availed will lead to reworking on the accounting entries by the assessee, as the same details were not required in the periodic returns. ClearTax GST will help the assessee file GST annual return to report the bifurcation with ease in the annual return. 4. Reporting of the amended transactions relevant to the FY 2017-18 filed in the returns of April to September of current FY or up to the filing of annual return of FY 2017-18 i.e. 31 Dec 2018, whichever is earlier. This reporting will be supported in GSTR 9 on ClearTax GST. The feature will reconcile the amended transactions of FY 2017-18 filed in current FY and report them accordingly in the annual return. 1. Is it mandatory to file Form GSTR-9? 2. Can I revise the GSTR-9 which has been filed? No. Currently, GSTR-9 does not allow for any revision after filing. 3. I got my registration cancelled in the financial year say FY 2017-18. Can I file Form GSTR-9? 4. Whether form GSTR-9 return is required to be filed at the entity level or GSTIN level? Form GSTR-9 return is required to be filed at GSTIN level i.e. for each registration. 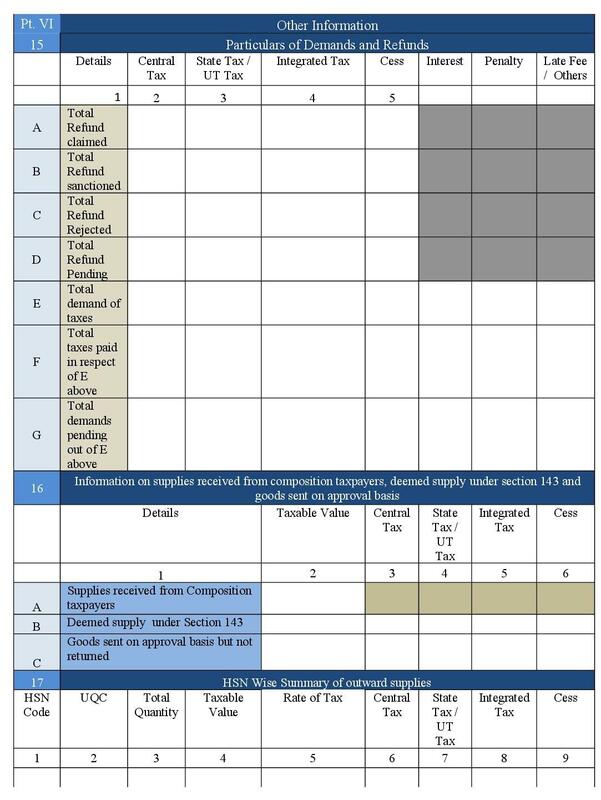 If taxpayer has obtained multiple GST registrations, under the same PAN, whether in the same State or different States, he/she is required to file annual return for each registration separately, where the GSTIN was registered as a normal taxpayer for some time during the financial year or for the whole of the financial year. 5. Should I match my input GST with 2A before filing GSTR 9? 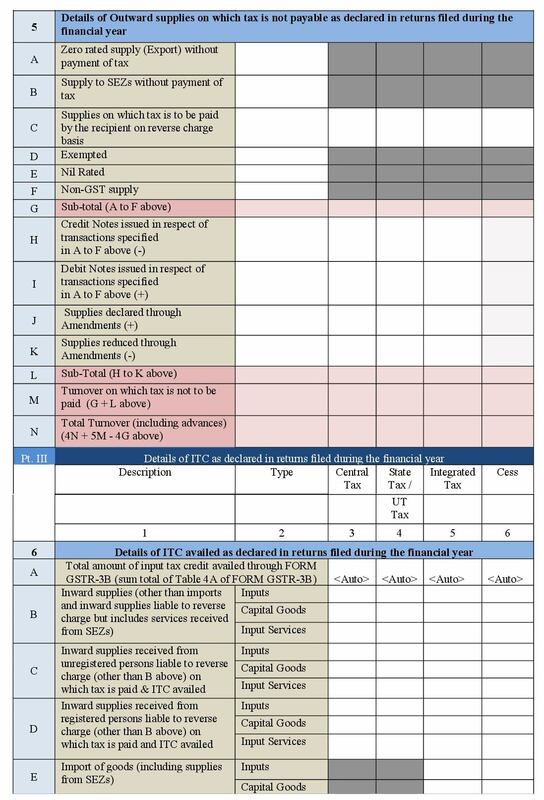 Yes, you must reconcile GSTR-2A for FY 2017-18 data with the input tax credit accounted in your books of accounts till March 2019 for FY 2017-18 data before filing GSTR-9. 6. Do we have to file monthly GST and GSTR 9 return after we have received the cancellation order, but the final return is pending? As per Legal provision of Section 44(1) of CGST Act, every registered person shall be required to file GSTR-9. Hence, even if the status of taxpayer is not registered as on 31st March 2018 but he was registered between July-17 to March-18, he shall be required to file the GSTR-9 providing details for the period during which he was registered. Similarly, if a taxpayer had applied for cancellation of registration but the application was pending as on 31st March 2018, he shall be required to file GSTR-9. 7. What happens to the provisional credit recorded in books of accounts and claimed in GSTR-3B, if that is not reported by suppliers in their GSTR-1 and hence not reflecting in GSTR-2A? We can show as per the amount claimed in GSTR-3B. Also read our guides on How to file GSTR 1 on Government Portal and how to file GSTR 1 from Tally ERP 9 Release 6.